Seen here on a background of typical Magic Island muck, this slug is light yellow with white tubercles. Its perimeter is marked with purple spots that may merge into a continuous line. 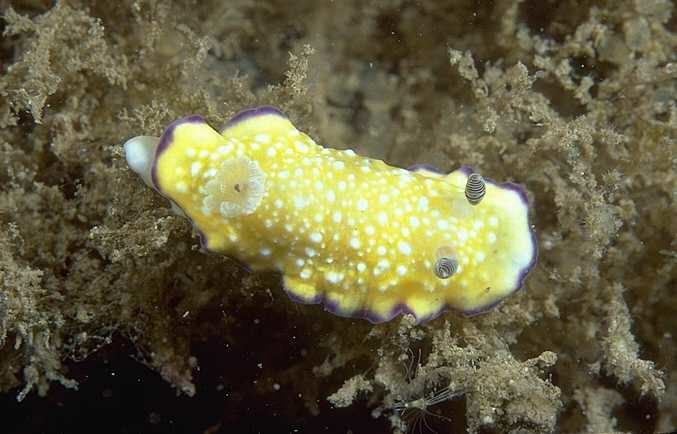 The rhinophores are brown with fine white lines and the gills are whitish. In Hawai`i the species occurs from the shoreline to depths of at least 30 ft. in both exposed and sheltered waters. It has an Indo-Pacific distribution and grows to about 1 in. Photo: Magic Island boat channel, O`ahu. 10 ft.
John P. Hoover lives in Honolulu. He has published two books on marine life of the Hawaiian Islands. 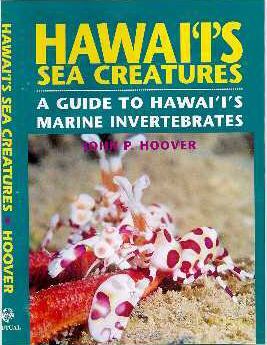 His third and most recent (pictured at left), is a field guide to the marine invertebrates of the Hawaii. This book is available now at a very reasonable price of $23.95, plus $4.00 shipping and handling within US from Sea Challengers. With over 600 photographs, it will cover 500 species, including 66 of Hawaii's most colorful and interesting opisthobranchs.